From the moment I saw this dress I knew it was going to be a perfect fit for me. 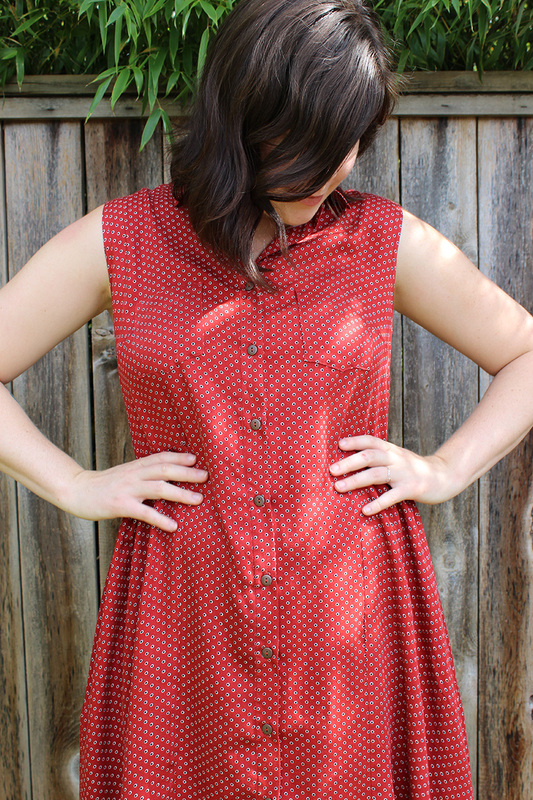 I absolutely adore shirtdresses and this one is so beautifully designed with its gathered sides and back. It is the Alder dress from Grainline Studios, my first make from Jen’s collection and I am completely smitten. The pattern was high quality, with easy to follow instructions and nice graphic design (something I always appreciate). Side note, this is my 10th make on the blog! The last 2 months have been incredibly fun, motivating and fulfilling, thanks for following along on my sewing adventure. I decided to make this beauty in some treasured rayon I have been saving for a special garment. This fabric is so delightfully soft with just a touch of sheen, and of course polka dots, my fav! I felt that this fabric could easily be dressed up or down, so it is a perfect fit for the Alder. I think it was a bit on the thin side for the structure of the pattern, but thankfully it worked out! Shirtdresses always take longer than I am expecting, I think I get excited about not having to put in a zipper and I’m like ‘this is gonna be sooo easy’, forgetting that in lieu of a zipper I have to make plackets, buttonholes, and sew a collar! On top of that, there is the impossible task of choosing buttons! I’ll admit it is a task I enjoy, but it still takes forever for me to decide. I ended up choosing a brass coloured button to play up the sheen on the dress. This is view B of the Alder dress, with the gathers on the sides and back. I’d like to make view A someday as well, maybe in a linen like Jen’s latest version. 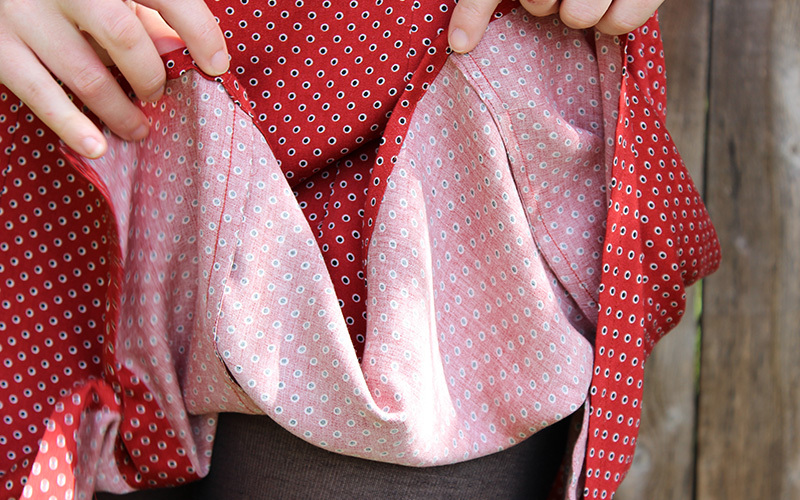 I also added inseam pockets because…pockets! I can’t live without ‘em, and I’m getting pretty good at french seaming these suckers. I used french seams on all exposed seams on this dress, even that gathered seam which was a little harrowing at the corners. Because of the drapey nature of the fabric, the gathered seam slopes down to the back on my frame. I actually like this quite a bit, but it is something to be aware of if you are considering a light Alder. This is my second collar ever (first one is here), so I was nervous about using such a lightweight fabric. I ended up interfacing one side of the collar itself, not just the collar stand, and that helped immensely. The cute little pockets turned out great too, although they are practically invisible amongst all those tiny dots! It is sort of like spot the pocket in these photos. I cant wait to make more from Grainline Studios, I have a feeling I will be thrilled with the results. I’ve got the Archer shirt, Linden sweater, Lark tee, and Duffle coat waiting in the cue. Happy Sewing! Great fabric choice, Helen! It looks beautiful. Helen, I can’t begin to tell you how pleased I am with how this lightweight alder turned out! The fabric is perfect, and your right about the fabric weight changing the drape of the gather (and maybe the yoke a little too?) I think the effect is lovely and adds to the flow of the dress in the lighter fabric. It’d be just as lovely if it held form a little more rigidly in a more structured fabric too. What a versatile, well considered pattern! The buttons are perfect and I’m glad you’ve finally gotten some pockets you can get your hands in without wiggling. Pockets are so important! How did you solve the seams for the internal pockets? Congratulations on 10 amazing makes Helen. Here’s to you and your closet, and especially for sharing your journey with us!